I’ve been finishing up my Paris Journal, adding images and words to complete the journal started long before I ever left the States. I preparation for this trip of a lifetime, I began collecting words in my Moleskine and then took it with me on my trip. Now I’m getting it ready to send in for a future article and one regret keeps coming back to me, I didn’t get to see Mona while I was there. Because it was my first trip, (I say that because it means I’ll someday go back-right?) I did all the touristy things. The things you read about, the images you see every time you read anything about Paris. High on that list, if not topping it, was to see the Mona Lisa. I didn’t rush right to the Louvre, but instead let anticipation build. I talked about saying ‘Hi’ to Mona with a little giggle of delight at the thought. I’d already seen another of Leonardo’s works, Ginevra de’ Benci when I visited the National Gallery of Art in DC, and I was on a mission to see Mona the most famous of his works. But, as often happens in life, it did not happen despite my best efforts. We planned for a whole day at the Louvre and found out that it was closed that day. Disappointed but not worried I scrambled to find another time and picked a day the museum was open late and I could go after my workshop. I scrambled to get there via subway and arrived before the appointed time only to find that they had closed admission early due to a high volume of visitors and an increased security risk. I couldn’t believe it. I was going to leave Paris not having seen the Mona Lisa! With other things going on with my family in the background, I didn’t let myself visit how sad this made me. Not until now, when I pulled out my journal to finish it up so I could send it off, did I let myself feel that disappointment. I will go back someday, I must, and seeing Mona will be the first thing I do! I don’t usually try to draw a face that is recognizable as ‘someone’. It’s a scary thing to do because the risk of failing is very high. 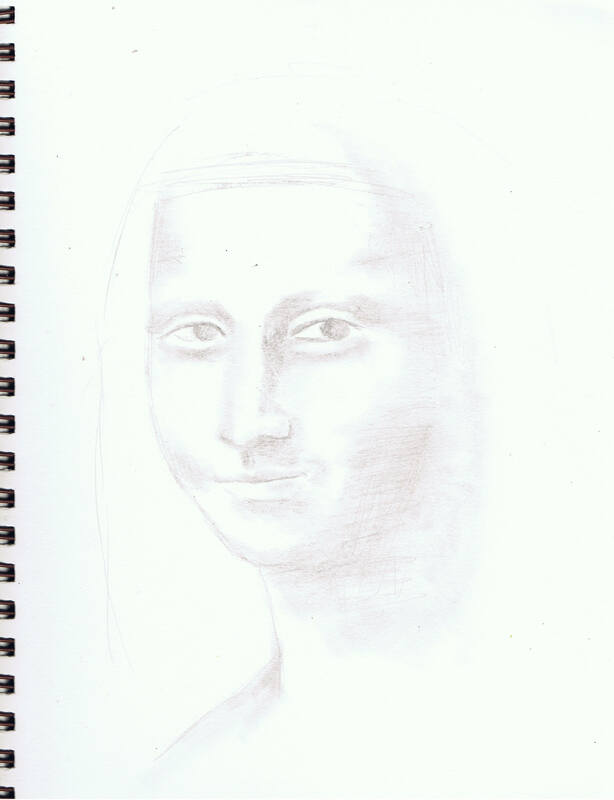 But with Mona on my mind I decided to give it a try last night. My first attempt is posted above. I’m not happy with it, but decided to share it to show that drawing takes practice. I’ve been seriously practicing sketching since 2008 (here is an interview Chrysti Hydeck did back then where I state that intention) http://alwayschrysti.com/always-chrysti/2008/12/15/day-1229-days-of-giving-is.html and you are never finished learning this skill. So after I finished the first attempt, I immediately started a second and I’ll work on finishing it later today. Maybe I’ll like it, maybe I won’t but that won’t stop me from continuing to pursue portraits. I love the challenge. I love that each face is different from the one before it. I love that I can see growth in my work. I love the discipline of sketching daily. When one sees Paris, it is always in the heart. We always want to go back. We were in Paris three years ago. We found out through Rick Steve’s travel guides that you can buy tickets to the Louve in advance online. That really helped. We found out there is a free day there that the locals all know about. We did get to see Mona, but only from a great distance. The space in front of her was roped off for probably ten to fifteen feet, then there was a crowd about ten deep trying to get a look. When you go back, take binoculars. But what amazed me was being able to get within touching distance of DaVinci’s other works, some of which are also famous. And the same with Boticelli and other famous artists. The inspiration was overwhelming. I could spend a whole week at the Louve and still feel like it wasn’t enough. Same with D’Orsay. Your work is inspiring, too, Pam. I just bought your book and am enjoying it very much. I am so thankful we can have this wonderful, magical, world of art. Ohhh, that’s too bad. You’ll definitely have to go back to see Mona. You inspired me to try to sketch her, even though I am really terrible at drawing people! I’ll be posting a photo on my blog shortly. Pam – no matter what you do, I’m inspired! Thanks so much for keeping your videos on your site – I’ve just spent my day off with the Shades of Gray – I still really don’t do shading well – but your easy to follow instructions and style of teaching just really makes me feel like you are in the room with me supporting the work I’m doing! While my page is a very “Pam” page, I did it on purpose to try to get shading down – and I think I’m getting it more! I’ll post it on the Journal 365 page when I’m done so you can see it – but thanks again for being so open and sharing with us on your video! I’m going to try another page – cold turkey – no Pam on in the room – wish me luck!!!! Will you be sharing your Paris journal on your blog? I would love to see it. what a perfect excuse to go back. love that you are going for it. these look awesome. 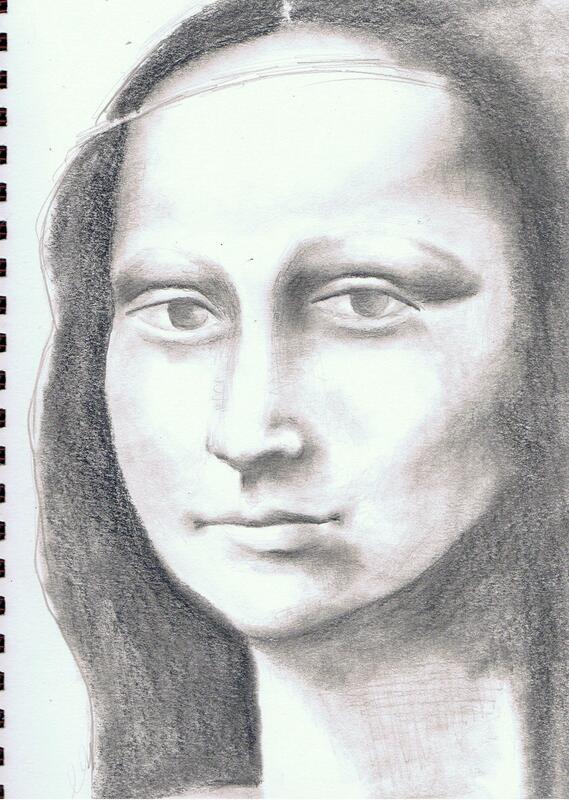 My youngest daughter was in Paris several years ago and did manage to see Mona. I asked her to make sure to buy a post card of her at the museum and mail it to me. She didn’t claiming she couldn’t find one! (Yeah, right!) To this day whenever she sees a Mona postcard…or I do…we’ll buy it and send it to the other! She looks great to me…very much like the original. I agree of course you must return, and just for the experience say hello to Mona this time. However, she is much smaller than I expected, not easy to really see through the glass,etc. The Louvre and D’Orsay hold many other easier to view treasures. So yes, return soon and enjoy all that you have time for.Maybe try Saint Paul de Vence in the south. Beautiful, artsy area. I knew it was Mona right away. It is very sad you didn’t get to see her and I think it’s terrible that the museum didn’t honor their opening hours. Most people never get to go once so keep dreaming and planning of going back but remember how very, very lucky you were to see any of his paintings and Paris…oh to see Paris! well that just isn’t good at all-now we both are on a mission! I’m so sorry you didn’t get to see her. I hear that the place is pretty packed from day to day, so it is hard to see. I went to the largest Monet exhibition in Chicago in the mid 90’s. The daily shows were sold out months in advance. There were people standing outside waiting to get in, in case of a ticket no-show…and they say that art is dead? I so totally disagree and disagree that they are taking it out of the schools!! You did a lovely job on her drawing. Renoir stated not long before passing that he was still learning, still reaching. It’s a habit and a practice–we do get better by doing. The more we draw, the better we get in seeing. Thank you for your workshops over at Strathmore!! I am incorporating the shading in my own journals now. Thank you! Hope you get back to see Mona Lisa! You’re too hard on yourself…your drawing is beautiful! And OF COURSE you’ll be back to see Mona 🙂 I am sure of it !! Well of course you’ll go back and Mona will still be there. I think your first Mona is quite lovely and I would have known who she was even without the title of your blog telling me. Very interesting sketch. You captured both Mona as well as yourself. I love that concept, intentional or not. Pam, I really like your Mona, I am going to try to draw her too, just for you. I was in Paris and I didn’t go to the Louve but went shopping instead! haha.. My husband and son went and my daughter and I shopped, from what I hear it’s a bit disappointing (Mona), it’s small it’s behind glass and there are always tons of people to shoulder around…but I agree with everyone else, you will go back, many times I’m sure. Just teach a workshop and have it paid for!